This is a reposting of an article featuring an interview with Yours Truly! 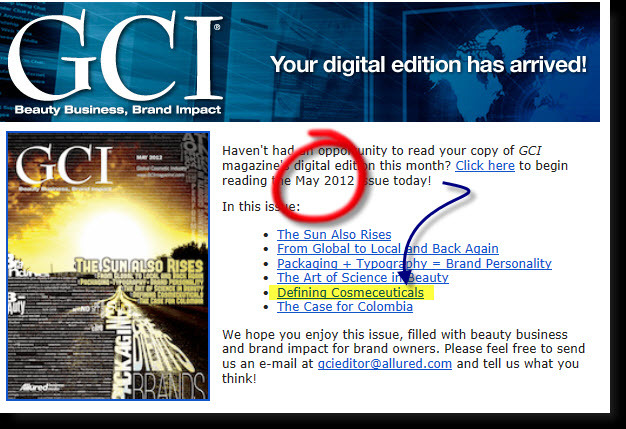 Written By: Sara Mason, Posted: April 27, 2012, from the May 2012 issue of GCI Magazine. Cosmetic chemists began to innovate, using delivery system technologies, high-tech ingredients and synthetic compounds that were gaining popularity in the pharmaceutical world. “The cosmetic industry began using words such as ‘encapsulated,’ ‘microsponge,’ ‘ceramide,’ ‘anti-aging’ and ‘time release’ and ‘retinol’ in their marketing vernacular,” continues Sikora. And the product claims—benefits—the manufacturers were making took on a new level of science and sophistication. In fact, skin care products began sounding very therapeutic and extremely pharmaceutical. So much so that suppliers were finding beauty brands weren’t even interested in active ingredients that didn’t penetrate or have biological activity. Unless, of course, those ingredients were from the medical or pharmaceutical industry—even if they weren’t biologically active, according to Presperse. ← A Blog Dedication… Read This First!